I wandered around Prague's Vinohrady district, looking for something to eat after work. I have a long list of restaurants in my head, but nothing stood out. Tiger Tiger? Had Thai last night. Samurai for sushi? Too expensive. Potrefena Husa for burgers? Nah. Trattoria Roca for pasta? Don't feel like it. Ambiente for wings? Not tonight. Then, I remembered driving by a relatively new and attractive looking place a couple of weeks earlier. 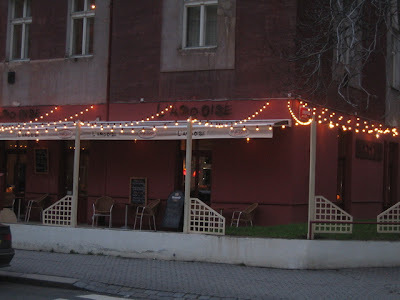 I headed up Londynska to the French restaurant, L'Ardoise. This can be translated as "The Chalk Board." There is, of course, a chalk board on the wall listing the daily specials. The non-smoking area had a number of children's toys placed around the room, though I didn't find out the reason for the motif. Perhaps it is meant to evoke a children's classroom. I should have asked. Next to the table was a combination abacus/black board. A bearded and friendly-looking bear of a man approached the table. This was Andre Deon, the owner. And he begins by asking, in French, about what we'd like to drink. Luckily, my intensive studies of the French language gave me the ability to understand every third word. I maintained the facade of full French comprehension for quite a while. But it turns out, Mr. Deon also speaks very good English and later offered the restaurant's menu in English, which I declined. A glass of the vin de la maison was ordered and deemed very good, but perhaps a little expensive at 110 CZK. The wine was poured very professionally, with a crisp twist of the bottle at the end of the pour. Not a drop wasted. They have a very nice looking wine list. I ordered "une grande biere." I received a half liter of Bernard. This beer has a very unique and specific flavor. Either you like it or you don't. Me? Not so much. They also have Pilsner Urquell by the bottle. There was something along the lines of an amuse bouche -- a small slice of bread covered with a dollop of what I think was whipped butter and a thin slice of lime. It was hard to tell if this was to make up for the lack of a bread basket. There was an appetizer of warm shrimp with green salad (160 CZK). It came with four fresh, tender shrimp, with heads on. They were very tasty, though not very large. There were just a few leaves of lettuce with light dressing. I was tempted by the tomato tart with grilled eggplant (120 CZK), but decided to leave room for dessert. Most of the main course are in the 300-400 CZK range. I got a taste of the sea bass (380 CZK). It was a whole fish, split at the top and filled with mixed vegetables. Very simple and fresh, it just needed a little salt. I had the veal Marsala with spinach and mashed potatoes (320 CZK). I ordered it medium, but it came out rare, though I think this was one of the, uh, rare cases where I think the chef knew better than I how the meat should be cooked. It was tender, with a somewhat tougher exterior. It was very red in the center, not the type of veal others might be used to. Also, the Marsala sauce was rich and creamy, but we both had trouble detecting any Marsala flavor. Again, salt helped. 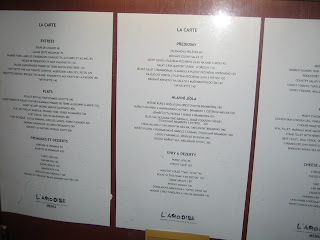 They also offered a steak fillet (380 CZK), leg of lamb (420 CZK), and a roast chicken (180 CZK). There are nightly specials, including mussels. For both the salad and the main courses, Mr. Deon brought us small baguette-rolls that look similar to those sold at Tesco. They did not seem very fresh -- a bit on the rubbery side --perhaps they were having a bad bread day. For dessert, I really wanted to try the Tarte Tatin. But in the end, I am a slave to chocolate. I chose the moelleux chocolat -- the warm chocolate cake with the liquid chocolate center (160 CZK). It is relatively small, five or six bites and it came with a small pool of toffee on one side. The cake was delicious, but the toffee did not add much. I would have much preferred a small scoop of ice cream. The words I want to keep using over and over again are "simple and fresh." Don't expect to be blown away by something new and different. Expect to feel transported to France. They do some basic French classics here, and they do them pretty well, but you will pay classic French prices. The final bill for the starter, two main course, one dessert, three glasses of wine and two beers was 1500 CZK including tip. A bit high for what you get. L'Ardoise got a nice review in the Czech Business Weekly in October 2006. 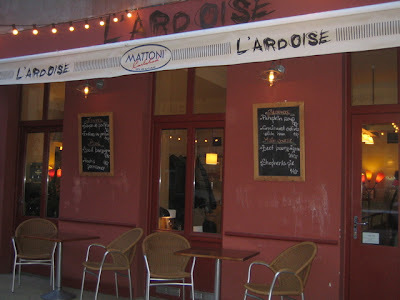 I'm sure I will go again to L'Ardoise, but I don't think it will break into my list of regular favorites. V. average fare and above-average prices, plus non-attentive wait staff when I visited. Won't be returning in a hurry. Been following your blog from the beginning when I came across this post in a search. I'm sure we must have been in the same place on more than one occasion! Buried this comment because I thought you might be interested in this and couldn't find a private email for you... have you seen google mymaps? Could be a great addition to your blog. Check this one that I put together as a demo from your last month's posts. Keep up the great work and be sure to check out Aromi on Manesova sometime -they have a new menu. Glad you like it. I do see all comments. My friend in Spain showed me Google mymaps when I was visiting. He posted a bunch of his pictures from his visit to Venice. I should figure it out -- I must admit, I'm a bit lazy -- posting anything with depth is more time-consuming than I like to admit. The thought of adding another step fills me with dread. I have recently been adding links to mapy.cz for restaurants though.